Advanced SystemCare PRO, from IObit, which the company claims as the world’s top system utility to enhance PC performance, is a simple-to-use, powerful and award-winning system tool that is designed to speed up and protect your personal computer by delivering a continuous, automated, all-in-one PC maintenance service with anti-spyware, privacy protection, performance boast-up and system clean-up capabilities. IObit Advanced SystemCare PRO normally costs $29.95 per 1-year single license. As part of IObit / PC Advisor promotion, interested users are now entitled to download the Advanced SystemCare PRO v3.7.0 for free! To grab a free license serial key and download link of IObit Advanced SystemCare PRO 3.7.0 full version, registering your email address at this promotion page. The IObit Advanced SystemCare PRO v3.7 can be downloaded from download.com. 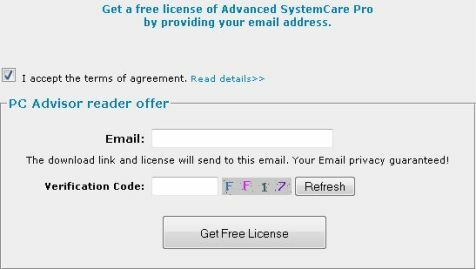 To activate the software, open Advanced SystemCare, click “Upgrade” button at the left bottom, and click “Enter License Now”, then enter the license to activate your AdvancedSystemCare Professional v3.